After an early start (during which I forgot to get a picture of the sign outside a nearby dance-school advertising, "Waltz, Foxtrot, Disco & Hip-Hop"! ), we headed along the coast, and found an unusual bunker complex on the North side of the D925, between Ramouville (Saint-Aubin-sur-Mer) and Etretat. Largely overgrown, each of the three buildings has a long ramp leading to the roof, apparently designed for vehicle use. 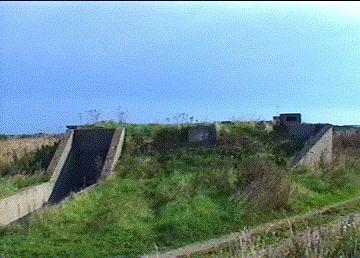 The upward slope of the ramps points towards the sea, so perhaps they were intended to temporarily site tanks or artillery pieces in order to gain advantage on the flat landscape. Exterior of overgrown bunker. The small turret-like objects on the right are actually chimnies, while the roof to the ramp is on the left. 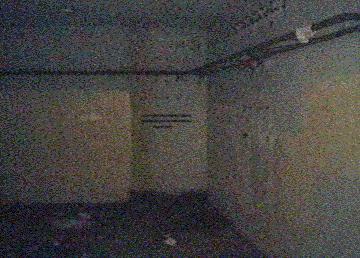 Interior of bunker. We stopped to stretch our legs at Eretat - and I obviously took the opportunity to check out the remains of the wartime defences - before we continued over the recently-built Pont-de-Normandie bridge. 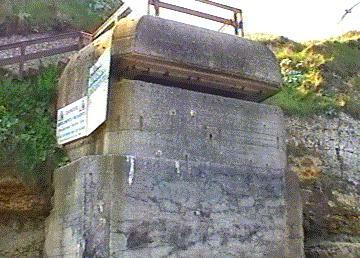 Defensive bunker at Etretat. 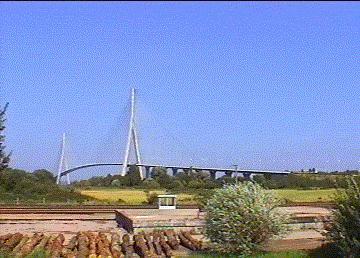 Pont-de-Normandie bridge. At 00:20 hours on 6 June, elements of the British 6th Airborne Brigade landed at the extreme west of the Invasion area, either by parachute, or in Horsa gliders. One of the first objectives was to capture the bridges across the Orne river and the canal running parallel to it. Three gliders landed on the narrow strip of marshy ground between the two watercourses, less than 50 yards (and in one case a mere 20) from the Benouville swing-bridge over the Orne. Incredibly, the German guards heard nothing, and after a brief firefight the bridge was in British hands by 00:30. The glider troops resisted all German counter-attacks until they were relieved by their reinforcements, who were only two and a half minutes behind schedule! 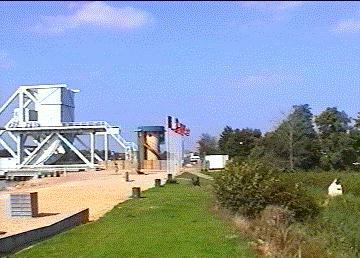 The original Pegasus Bridge was replaced in 1993 by a substantially similar structure, which still bears the same name, after the emblem of 6th Airborne. 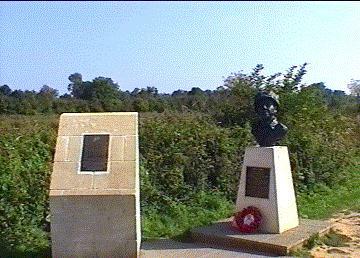 Nearby are a preserved British Centaur tank and German artillery piece, as well as memorials to the Allied troops who took part in the action, their commanding officer, Major John Howard, and Lieutenant Dan Brotheridge, who was killed during the taking of the bridge - the first Allied soldier to die on D-Day. Nearby, along a path winding through the marshland, three stone markers indicate the actual final resting points of the gliders, dramatically illustrating the skill with which the pilots managed to land so close to their objective. 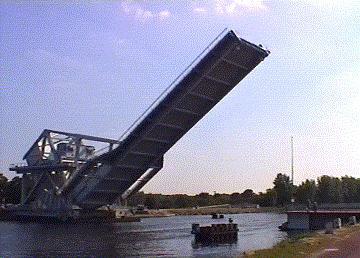 The modern Pegasus Bridge. 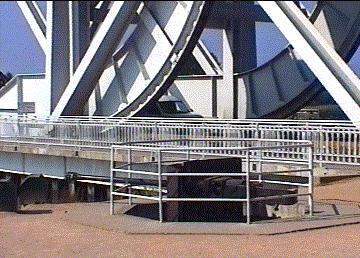 Preserved German gun next to the Bridge. The glider landing marker closest to the Bridge, with memorial to Major Howard. The Bridge, with the marker and memorial on the right. 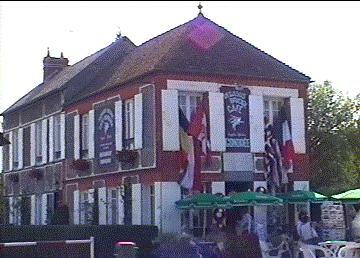 The Café Gondrée - now Pegasus Café - where Major Howard set up his temporary headquarters after the capture of the bridge. Behind the Café is a small museum. 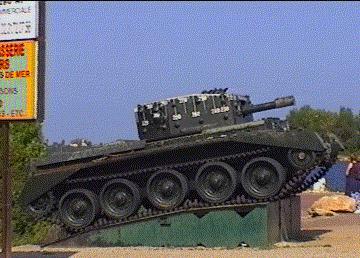 A 75mm howitzer-armed Centaur tank of the British Royal Engineers. The base on which it stands bears the message: "Constructed by the Engineers of the 3rd Division June 1977 'who also passed this way........' June 1944." After crossing Pegasus Bridge, we headed along the coast-road, across the Second (British) Army sector on D-Day, and paused at Saint-Aubin-sur-Mer, which overlooks part of the Canadian Juno Beach at its centre. 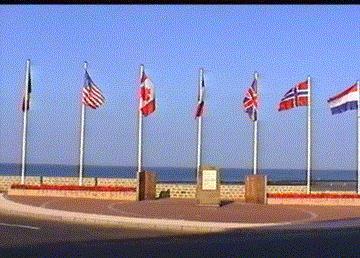 Juno memorials at Saint-Aubin-sur-Mer. 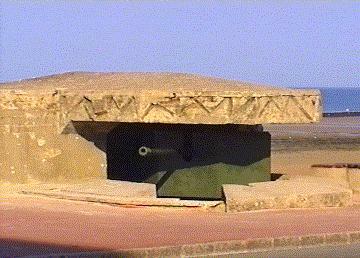 Preserved German gun on the seafront. We had planned to stay at Arromanches-les-Bains, which overlooks the British Gold Beach, but after fruitless hunting around for a hotel with vacancies, we repaired to Bayeux, and were more successful there with the exceptionally pleasant Hôtel Reine Mathilde (23, rue Larcher), which turned out to serve the best bread at breakfast of anywhere we stayed. In the long-run, it was a wise decision, as the town is ideally suited as a starting point for visiting the whole Invasion area, yet sufficiently off the more usual beaten tourist track (despite the Tapestry! ), and so we decided to stay for four nights. Venturing out for out evening meal, we settled on something of a French peculiarity - a restaurant attached to a butcher's shop (Lat Table du Terroir, 42 rue Saint Jean). As one would expect, excellent quality meat, whether cuts or paté, etc., but definitely not one for vegetarians!